My First ScaleExtric set 1 only cars. Produced by Hornby Hobbies of England in 2007. 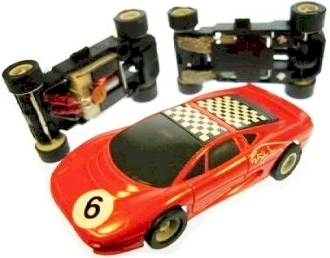 Compatible with most HO electric racing slot car race track sets including Life-Like®, TYCO® Mattel®, TOMY® AFX® Racemasters™, auto world®, Model Motoring®, Aurora® Lock & Joiner, Aurora® AFX® Speed-Lok.